One summer in Montmartre, a shy librarian, Julie (Dominique Labourier), and a magician, Celine (Juliet Berto), strike up a whimsical friendship based on storytelling and role-playing. Their games of imagination eventually lead to a boarded up old house where they become first spectators and then participants in a murder mystery that replays day after day. Like the works of Lewis Carrol, which it clearly references, the story has a dream logic all its own. The action moves from realism to the fantastical through the medium of magic. Celine and Julie are able to enter the house together because of a potion, and are able to recall what they have seen and experienced only by sucking on a sweet they discover in their mouths after emerging. Memories are as elusive here as dreams are to a sleeper awakened. The story within a story, at first muddled, gradually becomes clear, and the two women are impelled to change the outcome. The idea of watching and being watched, of filmmaking and film going are themes that run throughout the film. The haunted house becomes Celine and Julie’s very own picture palace where the same show plays every night. Who hasn’t wanted to step into a favourite movie and change the outcome? 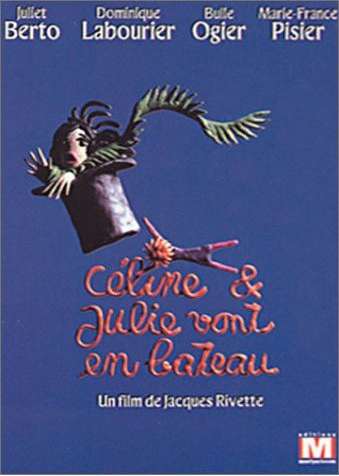 When the two women become part of the narrative the fourth wall should be broken but in Rivette’s world there is no artifice and reality; everything is just another layer of fiction. In this hall of mirrors, imagination is the only escape. We reserve the right to correct any errors or to abbreviate or reject reviews we deem as inappropriate, offensive, or spam. By submitting your review here, you are giving newwavefilm.com permission to reprint your review here and elsewhere on this site.